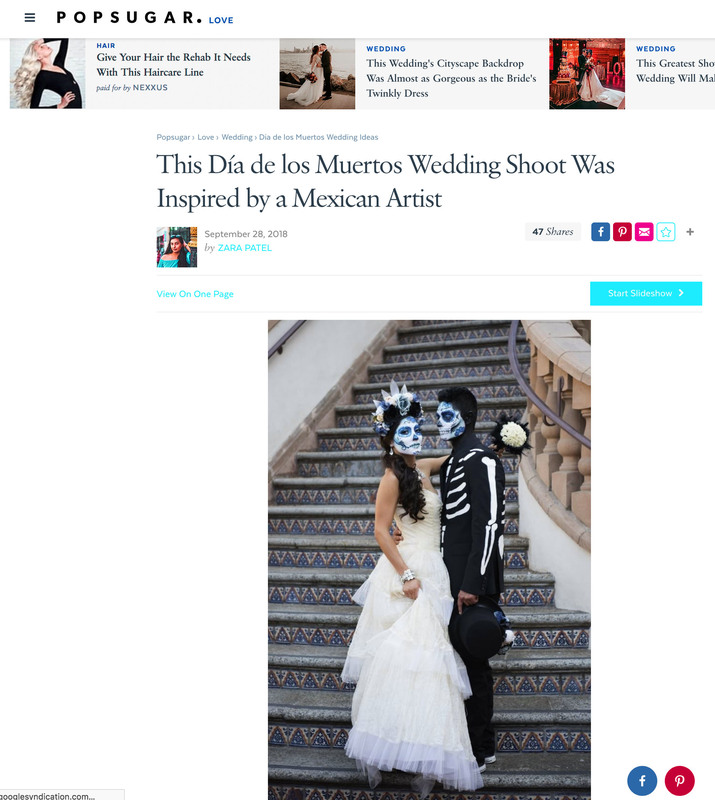 My Dia de los Muertos Wedding Shoot is Featured on POPSUGAR! September 29, 2018 February 22, 2019 by kryztyne2012Leave a Comment on My Dia de los Muertos Wedding Shoot is Featured on POPSUGAR! It’s been an exciting couple of months around here and it’s been a real challenge to contain my excitement! Especially because I’m really terrible at keeping secrets! First, I was published in a print magazine AND my team and I got the cover. Then, I found out my Dia de los Muertos photos were going to be featured on POPSUGAR as well! I’ve been familiar with POPSUGAR for a while, especially because they had a really nice subscription box. But, they are so much more! They’re a lifestyle website that “delivers the biggest moments, the hottest trends, and the best tips in entertainment, fashion, beauty, fitness, and food.” How cool is that? I’m still in love with this Dia de los Muertos shoot and just so thankful for the team of professionals that helped me bring it together. And now to find out that it’s featured on such an amazing website is a dream come true! PS: There seems to be some confusion about the Grooms Coat. It was inspired by the coat worn by Daniel Craig in the James Bond Movie, Spectre. But, the bones on the coat and tie were lovingly hand painted by me! Yesterday I hosted my first styled photo shoot and I’m thrilled that everyone has been so enthusiastic about it. There are so many incredible shots of these beautiful models and it’s difficult to pick a favorite! I couldn’t have done this event without the help of some amazing people and I’m so thankful for them! The makeup was created by Drop Dead Gorgeous Artists and the models looked epic! Beautiful gowns were provided by fashion designer Kasha Faye Designs and gave the shoot an extra glam vibe. From cake to rings to flowers and all the other important details I was able to reach out to my friends for help and they really delivered! For this shoot I put on my creative hat and designed the headdresses and hat, hand painted the grooms jacket, and wrote in calligraphy on the invitation envelopes. I came up with a concept for a succulent garden on the cake table and I’ll be sharing that in a future post. To see more photos from this shoot from the other photographers go to #ddlmshoot2017 on Instagram. Now it’s back to editing photos!